The plan for the airfield, which has been disused since the 1970s, includes 2,068 homes, a school, care home, shops, eight travellers' pitches and floodlit sports facilities. Helen Jefferies, of Wisley Action Group, said its classification as a brownfield site was misleading, because only about 24% was previously built on. 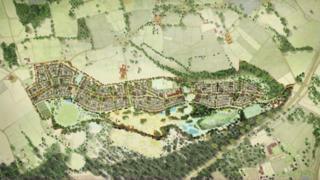 Residents also say the development would swamp Ockham village, which has 159 households. The airfield has been earmarked for housing in the new Guildford local plan but councillor Matt Furnis said this did not mean developers got a free ride. "They have to work through the issues," he said. "But we do have to deliver housing in the South East. Guildford is a challenging area and some tough decisions do have to be made." Mike Murray, for Wisley Property Investments, said it was normal for councils and applicants to take their time to get developments right. "We haven't decided on our next steps but for sure we think we can resolve the issues in the refusal," he said. "Thee biggest one is about transport. "Highways England are also working up a road investment strategy for junction 10 of the M25, so this is all very current."